Having never read any of Dervla Murphy's writing before picking up her autobiography at the library last week, I only knew that she wrote travel stories about cycling in far-flung parts of the earth. If I were to have read about her epic cycling journeys before reading this autobiography first, I suspect I would have spent a lot of time wondering: "How on earth does such a woman exist! And what kind of a life brought her to the point of contemplating this lifestyle?" I wonder if the writing of this autobiography was in part an answer to such questions she no doubt received after becoming well known as "the mad Irishwoman on the bicycle." 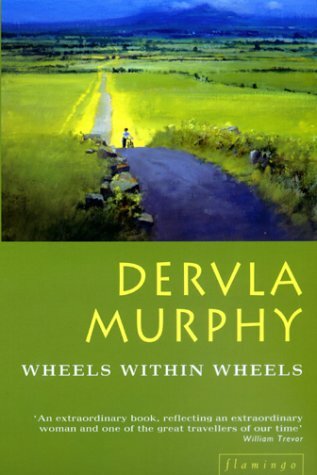 Reading Wheels Within Wheels is like being transported to the Irish countryside in the 1930s and 1940s; Dervla Murphy is capable of so vividly rendering people and place I feel as though I know what she describes. I could easily picture all the scenes she recounts, although she follows the advice given to every learner of writing: "Show, don't tell." and she does this with aplomb. 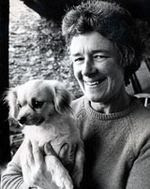 Born in 1931, in Lismore, Ireland, the only child of her librarian father and invalid mother. She depicts a childhood of permissive rambling and cycling around the countryside. Dervla Murphy paints portraits of some of the most significant figures in her childhood - her grandparents, various servants, teachers, and friendships. Her ability to self-educate especially when her opportunity for schooling was taken away is astounding, and yet she never seems to fall into the trap of either bravado or self-pity. Her writing style is smooth, apparently effortless, and eminently readable. When she was removed from school and retained at home as her mother's carer she reveals a disintegration in her lifestyle both shocking and terrible to read. She suffers greatly, but tells her story with an unvarnished honesty we have come to trust. When both of her parents are gone and she has gained her freedom she emerges from her seclusion as a butterfly from a cocoon. She struggles to suppress her socially inappropriate exuberance at the death of her mother. Dervla Murphy is a deft storyteller, an honest writer, a kindred spirit and a mentor. I will be searching out her other writing as soon as possible.